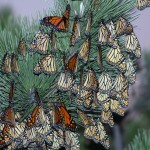 On a beach just outside New York City limits Barbara discovered hundreds of monarch butterflies one day in 2005. Since then she’s been hooked on the spectacle and returns every year at this time to look for the roost. Barbara is now one of thousands of Americans who report their butterfly sightings on Journey North, an educational site that tracks all kinds of migrations. Most people don’t know that monarchs migrate or gather like birds on their journey across thousands of miles to California, Mexico and Florida. Lately citizen scientists are tagging them and mending wings with tape to help track their mysterious migration, which has been disrupted by a lack of their favorite food, milkweed. 1. Check Journey North to see where and when they visit your area. They’re flying south ahead of the freeze, which can kill them. 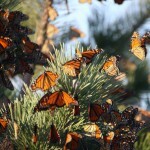 Unlike, say, cranes who only live in a few spots, you can spot monarchs anywhere. You’ll have better luck along the routes and keeping up with the migration wave. Overnight roosts are now in Texas and Oklahoma and 5,000 spent the night on Assateague Island, VA (better known for wild horses). 2. Go out after a rain. “the best migration and roosting days are after a rainy day(s),” Barbara says. 4. 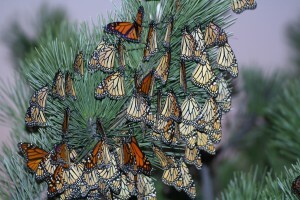 If you want to give something back to the monarchs, plant some milkweed for them to make up for habitat loss. 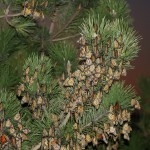 If you can’t find seeds in your area, check out Milkweedseeds.com or LiveMonarch.com, where you can get a pack for $3.